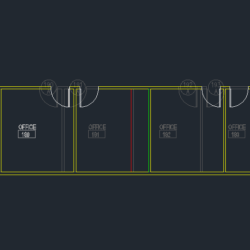 Although there’s no shortage of ways to customize AutoCAD, nearly every one requires some familiarity with programming. Given the barriers of learning a programming language, I find so many of the AutoCAD users I come across simply survive with the tools they already have verses learning to create new ones. This is the fundamental reason I love Action Macro’s so much; they allow users, with or without programming experience, to create new AutoCAD tools in an instant. The beauty of Action Macros is the way that anyone who can use the command line inside AutoCAD can also customize AutoCAD. Given how simple they are to create, I have found a wide range of ways to create and apply Action Macros over the years. One of my longtime favorites is using them to automate the setup and creation of new drawing sheets. The best way to ensure all of the sheets for a project plot the same is to create every sheet from a common layout template with the same page setup applied. While the procedure for doing this isn’t especially hard, it does involve several steps, and frequently becomes cluttered among the library of different sheet sizes used by most companies (Letter, Ledger, Arch D, etc). Using Action Macros I can dramatically simplify this process by creating a series of custom commands that will automatically create a new layout tab at the desired size.